These two products will activate a relay when any voltage between .1 and 9V is reached. One of them activates when the voltage is equal or greater, the other when the voltage is equal or less. Perfect for activating something based on any 0-5v sensor. MAFs, MAPS, TPS, Pressure and Temperature sensors are common sensors that fall into this category. Turn something on when the boost gets over some PSI. Turn on a big red light if the fuel or oil pressure gets low. Put one on a pressure sensor just past the fuel filter and it will indicate when the fuel filter needs changing. Put one on the TPS with a red light to tell your employees when they're wasting gas. The 12 turn pot allows you to easily make very small adjustments and the precision voltage reference means it will be very stable over time and essentially unaffected by noise on the 12V supply. The built in .1V anti-chatter level means the relay should not chatter. If you set the relay to turn on when 3V is passed going up, it won't turn off till 2.9V is passed going down. The device is so tiny you'll be able to hide it anywhere. In the picture you can see a quarter between the 2 boards. 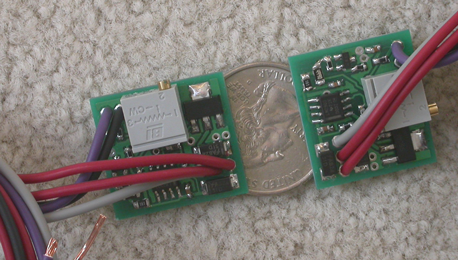 These are the first 2 prototype boards. If you want to purchase one of the first 4 of each type we have, call Robyn and she'll set you up. $30 each shipped, including a relay and a socket.